Today is a public holiday in Indonesia. Its pretty nice to have an extra day off during a hectic week. I woke up late, around 10 am and spent the whole day doing my unfinished business. Sewing my Pretty Odd stuffs, rearranging the shelf and browsing about Hong Kong. By early next week, I'll be flying there for a business trip. I'm sooo excited and worried at the same time. This is not my first time flying there, but this is definitely my first business trip to Hong Kong. But I know that this is one of God's plan for me, the best one. I went through ups and downs in the past two weeks. I can say last week was my lowest point. By the time I was in misery, I got the news that I'll be going to HK. I instantly cried in happiness hahaha. 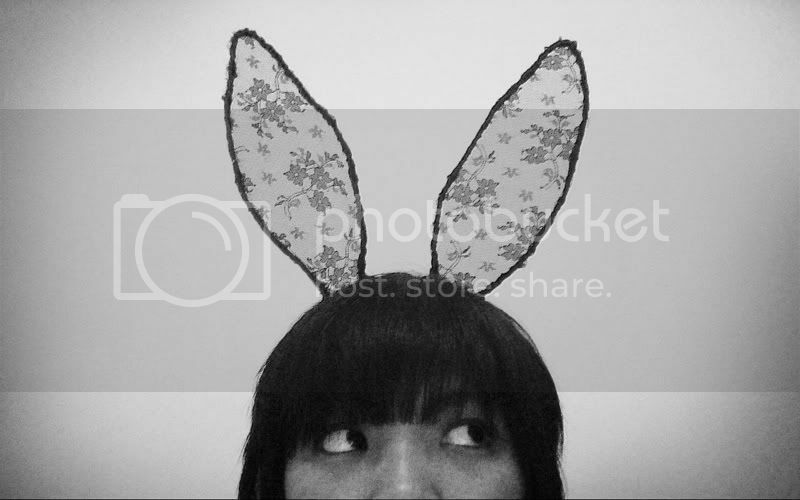 Just made a DIY bunny ears, similar to what I made for my Pretty Odd. But I used lace instead of peach wools.